Bed and Breakfasts near Alloa Athletic Recreation Park for 1 night from Tue Apr 23, 2019 to Wed Apr 24, 2019 within 25 miles, in an Average Nightly price range of £1 to £200. Garvally House is a beautiful substantial mid victorian villa. Situated in Clackmannanshire six miles from Stirling Castle within easy reach of major transport routes road rail and airports and less than an hour from the major cities of Edinburgh Glasgow Perth and Dundee. Garvally House has a 5 Star Gold grading awarded by Visit Scotland. All rooms are large and well proportioned.The house sits in its own walled garden. Bathrooms are en-suite and equipped either with high power showers within large shower enclosures or with a modern freestanding bathtub. There is a comfortable Lounge for guests use. /p p The walled garden is largely ornamental with many flowering shrubs and plants although substantial fruit and vegetable plots remain and are continually developed to provide fresh home grown produce for the kitchen. Excellent Food is a top priority at Garvally House. Located close to Stirling, Garvally House offers high quality bed and breakfast accommodation in a spacious Victorian building. Free parking is possible on site, and free WiFi is accessible throughout. Garvally House offers en suite rooms with either a high pressure shower or roll top bath. The generously proportioned rooms are decorated with neutral tones and fresh flowers, and each comes with a flat-screen TV, bath robes and tea/coffee making facilities. A gourmet breakfast is cooked to order and included in the room rate. High-quality ingredients are used and the eggs come from the property's own hens. Garvally House is also open for evening meals, utilising local produce where possible including lamb from nearby Muckhart. Stirling Castle is 7.3 miles from the property, and several golf courses are located within a 15-minute drive. Edinburgh Airport can be reached in 35 minutes by car. In Falkirk's countryside, 14th-century Airth Castle Hotel enjoys a peaceful setting. Once owned by the family of Robert the Bruce, it has a luxury spa, an elegant restaurant and stylish rooms. The Castle's former stable block now houses modern guest rooms, some overlooking the courtyard. All rooms have a flat-screen satellite TV, free tea and coffee and ironing facilities. The award-winning spa features a pool, sauna, hot tub, steam room and beauty treatments. The gym equipment includes touch-screen TVs and iPod docks. The Glasshouse Restaurant and Piano Bar serve local, seasonal food beneath a pyramid of glass. The Castle's Business Lounge offers a light menu and drinks. The Castle Hotel is 30 minutes' drive from Edinburgh and 45 minutes' car journey from Glasgow. Historic Stirling, with its Castle and the Wallace Monument, is a 20-minute drive. The 3-star Holiday Inn Express Hotel offers pet friendly accommodation at Springkerse Business Park. The M9 and M80 motorways can be reached within 4 miles of the hotel. The hotel features free Wi-Fi throughout, and a bar and restaurant. At the hotel, all rooms are equipped with a desk and a flat-screen TV. There is also an en-suite shower. Guests can take their pick from soup, paninis, pizzas and burgers in the relaxing Great Room lounge and enjoy a refreshing drink from the licensed bar. The hotel has a business centre with a meeting room and audio/visual available for hire. Local attractions such as Stirling Castle and National Wallace Monument can be reached within 4 miles. Stirling Golf Club is just 3 miles from the hotel. The nearest airport is Edinburgh Airport, 39 km from the accommodation. Kings Seat is located in Dollar and offers a garden, a terrace and a bar. Guests staying at this apartment have access to free WiFi. The apartment features a TV. The accommodation is equipped with a kitchen. Fishing and hiking can be enjoyed nearby. Perth is 36 km from the apartment, while Stirling is 20 km away. Edinburgh Airport is 52 km from the property. Check in and Chill out With free Wifi throughout all public areas bar and restaurant and with free car parking right in the centre of Stirling we are the hassle free choice. An ideal setting for leisure business and special occasions we welcome you to a hotel full of character comfort and charm. From our well appointed bedrooms to two dining options you can relax and unwind at the end of your day in Stirling when staying at the Golden Lion Hotel. Just down the hill from Stirling Castle s age-old battlements and a short trip from the famous Monument to William Wallace as well as the splendid new Battle of Bannockburn Visitor Centre the Golden Lion Hotel makes an ideal base for anyone touring Scotland. The hotel s city centre location is only a few minutes drive from the national motorway network. Stirling s principal bus and rail stations are within easy walking distance of the Golden Lion s front door and there is an excellent choice of shops with many famous name stores virtually next door in the extensive Thistles Shopping Centre. The Warmth of our Welcome Awaits You! The Golden Lion Hotel has exclusive secure car parking spaces available (subject to availability at time of arrival) free at the rear of the hotel via the signposted archway on Murray Place. Please note that the hotel entrance stands on a one-way system and the archway to our car park is easily missed so please approach slowly. For directions from the north and south please Click here You will enter into a pedestrian precinct that show No Access signs - you need to PASS STRAIGHT THROUGH THESE TO GET TO THE HOTEL (There is a disclaimer at the bottom of the sign allowing access to the Golden Lion Hotel) Once you pass through the signs you need to turn right into the car park entrance which is approximately way along the street after the Imperial Cancer Research Shop and before the Edinburgh Woollen Mill shop. Please note that this is a back entrance to the hotel so you will not see the hotel at this point. Call us on 01786 475351 if you need help in finding the car park. Stirling Castle Walk Bed & Breakfast offers 8 bedrooms of character in a brilliant location in the heart of Stirling s castle precinct. The guest house built into the historic Stirling city walls is a short walk from rail and bus stations restaurants and bars and close to a wide array of activities including: cycle and hiking routes highland games venues heritage sites battle memorials stately homes iconic golf courses and salmon-filled rivers. br / br / br / br / The door to the B&B is at the start of the Back Walk Scotland s oldest maintained public walkway. br / br / br / br / Stirling Castle itself is a much-loved attraction offering guides in historical outfits wielding lutes swords and bedpans and an impressive Lego recreation of Stirling castle in a bygone era. It has a rich history and has been home to a line of kings queens and important historical figures from James VI and Mary Queen of Scots to Bonnie Prince Charlie William Wallace and Oliver Cromwell. br / br / br / br / There is plenty of family fun in this part of the world including the interactive battle recreation games at the Battle of Bannockburn site a safari park with lions go-karting treetop zip-lining laser and paintball. Quaint beach and golf village St Andrews is just over an hour away Gleaneagles about 20 minutes by road while Glasgow is a quick 25-minutes train journey and Edinburgh less than an hour by rail. br / br / br / br / Scotland is literally at your doorstep. This iconic Stirling guest house is under new management and has recently been refreshed. All bedding including pillows mattresses sheets and duvets is brand new and top quality. Parking is free at night in the streets nearby and there is inexpensive daytime public parking and 24 hour undercover parking available nearby. The B&B s proprietor Jackie will be on hand to make sure you have everything you need for a comfortable and enjoyable stay. Coralinn offers spacious and comfortable rooms in a modern home with traditional Scottish hospitality. 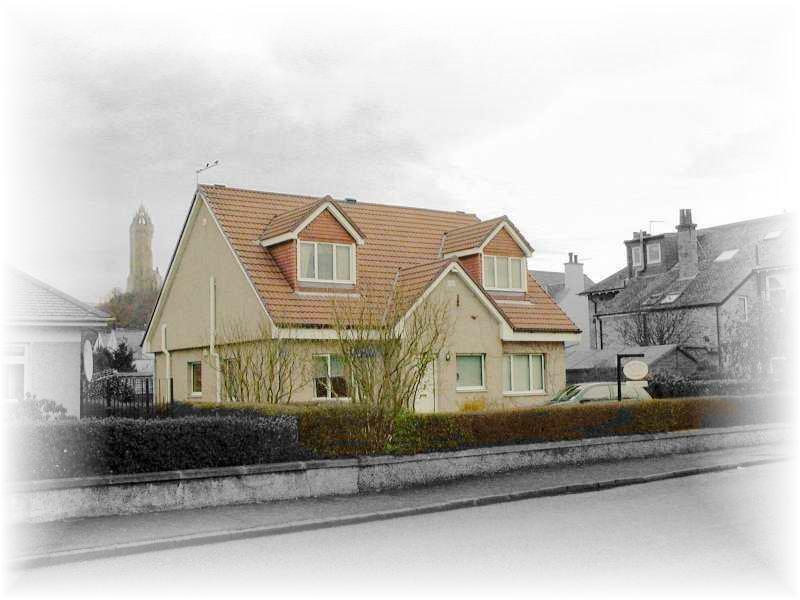 We provide quality bed and breakfast accommodation situated in Bannockburn Stirling. br / br / br / br / We are a non-smoking establishment all rooms are en-suite with free Wi-Fi and we have secure off-road parking available. br / br / br / br / Coralinn is located in the City of Stirling also known as the Gateway to the Highlands and is a significant part of Scotland s history. The Trossachs National Park is about a 35 minute drive away so Coralinn is ideally situated to explore this beautiful part of Scotland. br / br / br / br / The Bannockburn Heritage Centre which houses the story of the Battle of Bannockburn and Robert the Bruce is a short 5 minute walk away and the National Wallace Monument erected as a memorial to William Wallace is located a 10 minute drive away. br / br / br / br / Stirling and Central Scotland also offer a variety of outdoor pursuits and other activities which will suit everyone from sporting and wildlife enthusiasts to couples or young families. Brucefields Family Golf centre is a 2 minute drive away and boasts an 18 hole golf course as well as a 9 hole par 3 course driving range with bar restaurant and American Golf shop. Fishing and horse riding activities are available at Wellsfield Farm a 10 minute drive away. Welcome to the Munro Guest House in the centre of the City of Stirling the heart of Scotland. br / br / br / br / Munro Guest House is a 3 star guest house in Stirling City centre five minutes walk from bus and rail stations ten minutes walk to Stirling Castle and within easy reach of the Wallace Monument. Close to shops restaurants and pubs so no need for a car once you arrive. br / br / br / br / Stirling itself is packed with history and faces an exciting future but is also an ideal base to visit all of Scotland s top paid for and free attractions within easy reach of Glasgow Edinburgh Loch Lomond the Trossachs National Park and beyond. br / br / br / br / The Guest House has 6 rooms - each fitted with bedside USB points a TV (with integrated DVD) as well as equipped with a hairdryer and hospitality tray for the much needed refreshment at the end of a busy day. br / br / br / br / There is free WiFi throughout the guest house and a smart TV in the guest lounge for your convenience. br / br / br / br / The house was built c1895 and has been a Guest House in various guises for the last 40 years. br / br / br / br / Richard McKendrick is the current proprietor. Having initially gained a Law Degree Richard has worked (paid and unpaid) in the Health & Social Care sectors for nearly 30 years which enabled him to live/work in Dublin California London and Northampton (his home town) before he saw the light and decided to come to Scotland the home of his ancestors. br / br / br / br / Richard is very happy to assist you with information and ideas and as you will see the website also provides links to a selection of attractions and information. br / br / br / br / If you would like to discuss a bespoke booking (weddings family gatherings birthday celebrations etc.) then please contact Richard (for insurance purposes neither hen nor stag do s are allowed). The King Robert Hotel is a modern hotel situated in historic Bannockburn which offers all the facilities for the business traveller and leisure guest alike. Only a few minutes from the city of Stirling and a short drive from the Wallace monument and the Falkirk Wheel there are many places of interest to explore on our door step. All 52 ensuite rooms are non smoking and have free wireless internet access satellite television and tea & coffee making facilities. Evening meals are served in Bruce s Bistro which uses the finest local produce when available and the lounge bar is open through out the day for lunch or for a relxing drink in the evening. Free car parking is avialable on site to all guests. Located within the University of Stirling campus and set in 300 acres of beautiful parkland Stirling Court Hotel is just 10 minutes drive from Stirling city centre and less than an hour from both Glasgow and Edinburgh. Stirling Court Hotel offers a home-from-home environment. It has a bar restaurant and leisure facilities including a 50m swimming pool a modern gym and 9-hole golf course within the grounds. There are a number of shops on site including a pharmacy bank and supermarket. The Macrobert Arts Centre has a full programme the latest films live theatre concerts and exhibitions. The hotel also has award-winning business facilities with 24 fully equipped meeting rooms. Abbeycraig the hotel restaurant serves a varied selection of dishes. Menus are seasonal with elements locally sourced where possible. You can also enjoy a drink or light bites in the modern lounge bar. The 5 star Victoria Square offers luxurious accommodation in the peaceful and prestigious Kings Park area of Stirling a couple of minutes from Stirling Golf Club and just a short walk away from Stirling Castle the Smith Museum and Art Gallery other Stirling attractions and Stirling transport stations. Easily commutable to Gleneagles Edinburgh Glasgow and the Trossachs and just minutes by car from the M9 we are ideally located to welcome the tourist and business traveller alike. The Orangery restaurant offers refined dining in a relaxed setting. Delicious light lunches and Traditional Afternoon Teas and from April 2019 evening meals will be available Guest facilities include: Free WiFi 32 Smart TV s silent mini-fridges complimentary refreshment tray and bath robes in all bedrooms Spacious and comfortable guest lounge stunning commonwealth ceiling in the dining room. Breakfasts cooked to order Limited parking on site Enjoy a friendly welcome and excellent service in luxurious surroundings. Please note we are unable to accommodate children under 12 or pets and we are a No Smoking property. For group bookings please contact us directly as booking conditions differ. Located within landscaped gardens, 20 minutes from Edinburgh Airport, The Grange Manor offers free parking and free WiFi. With a restaurant and afternoon tea selection, the hotel is next to the M9 motorway. Set in a grand period building, the rooms at Grange Manor are decorated with Scottish tartans and have private bathrooms. All rooms feature seating areas, satellite TVs, work desks and tea/coffee making facilities. Cook's Bar & Kitchen is located in the grounds of the hotel. This 19th century coach house offers warm and stylish decor with a relaxed and welcoming atmosphere. Catering for a wide range of tastes, it is the perfect place to enjoy an evening meal for our residents. The Grange Manor Hotel is located between Falkirk and Grangemouth. Both historical Edinburgh and lively Glasgow can be reached in 35 minutes' drive. Stirling is a 15-minute drive away. The Grange Manor sits beautifully in its own landscaped gardens on the outskirts of Falkirk and Grangemouth. Our unique position between Junctions 5 and 6 of the M9 motorway makes us an ideal choice for the business travellers visiting both Falkirk and Grangemouth and the leisure travellers wishing to base themselves in one location for a few days or longer to explore the surrounding area. Located 18 miles from Edinburgh Airport. All rooms are well equipped with all of the amenities you would expect with complimentary WiFi throughout. En-suite good-sized double bedrooms. All with colour television and satellite connections direct dial telephone work areas trouser press iron and ironing board hairdryer and hospitality tray. Free parking is also available. /p Glasgow and Edinburgh can be reached in 35 minutes by car. The Grange Manor is located within walking distance of The Kelpies on the outskirts of Grangemouth and Falkirk. /p We are very lucky to have a team of Chef s who are all very passionate about the food they produce and the experience you have with us. Breakfast is served in Le Chardon Restaurant within the main hotel while lunch and dinner are served in Cook s Bar and Kitchen which provides a relaxed and informal venue for dining 7 days a week. It is recommended that you book in advance for lunch and dinner especially at the weekends.We also serve Afternoon Teas 7 days a week and we recommend booking in advance. Traditional family-run hotel set in the historical port of Grangemouth conveniently situated as a touring base for the Kelpies and the Falkirk Wheel The Helix Park Stirling Glasgow and Edinburgh. Set 1.6 miles from the River Forth this modest hotel is 1.8 miles from the M9 motorway and 2.3 miles from football matches at Falkirk Stadium. Ideal for business and pleasure we have 48 comfortable well-equipped rooms and free WiFi is available throughout the hotel. Please note that all our rooms and public areas are strictly non smoking. Classic rooms sleep 1 to 4 people. All come with en suite bathrooms heated towel rails and work desks as well as flat-screen TVs and tea/ coffeemaking equipment. Food is available in Treetops Bar between 12:00 and 9:00 pm every day. The ballroom can seat over 200 people whilst the well-stocked bar offers relaxation and live televised sporting events on the large-screen TVs. Excellent customer service is our aim and we can assure you of a warm Scottish welcome at The Leapark Hotel. Offering free WiFi, Premier Lodge is situated in Grangemouth. The accommodation provides a 24-hour front desk. All guest rooms in the hotel are equipped with a kettle. All rooms include a private bathroom with a shower. At Premier Lodge every room is equipped with a desk and a flat-screen TV. Edinburgh is 42 km from the accommodation, while Glasgow is 44 km away. Edinburgh Airport is 30 km from the property. Situated only 4 minutes' walk from Central Retail Park and multiple restaurants, these modern apartments are in the heart of Falkirk. Carmel Apartments are serviced and fully equipped with appliances and furnishings. Each apartment can accommodate up to 4 adults and amenities including WiFi and towels are provided. The Kelpies and Helix Park are 5 minutes' drive from the apartments, and the Falkirk Wheel is 10 minutes' drive away. Other nearby attractions include Callender House and Dollar Park, both of which are a 5-minute drive from Carmel Apartments. There are several bars, restaurants and coffee shops less than 1 mi from the apartments. A 24-hr Tesco supermarket is 0.6 mi from Carmel Apartments, and the cinema, gym and spa are all located nearby in Central Retail Park. Situated minutes from the retail and restaurant area these modern apartments are in the heart of Falkirk offering the perfect blend of connectivity comfort and amenities. “All the comforts of home with the luxury and location of a premier hotel." Situated minutes from the retail and restaurant area these modern apartments are in the heart of Falkirk offering the perfect blend of connectivity comfort and amenities. All the comforts of home with the luxury and location of a premier hotel. br / br / br / br / The Space br / br / Fully equipped with state-of-the-art appliances and furnishings our Serviced Apartments offer all the comforts of home. From super fast Wi-Fi to plush towels we ve provided all the essentials. Our Apartments can accommodate up to 4 adults in comfort. br / br / br / br / The Area br / br / Probably the best located town in Scotland. Access the entire country via the major highway arteries that run through the area or use the two main line rail stations that are within minutes of the property. Fast frequent services to Edinburgh (24 mins) Glasgow (18 mins) Stirling (16 mins) and beyond. br / br / br / br / Falkirk itself offers many interesting attractions including The Falkirk Wheel The Helix Callander House Kinneil Heritage Railway good shopping and leisure facilities. Great access to Edinburgh and Glasgow Airports Golf at Gleneagles Glasgow s shopping and museums and Edinburgh Winter Festival Hogmanay International Festival Tattoo Film Festival and Book Festival. The Kelpies Helix Park Falkirk Wheel and Dollar Park are all within easy reach. Falkirk has many beautiful attractions. br / br / br / br / There are numerous restaurants bars coffee shops etc minutes walk away serving drinks and meals all day. A 24hour supermarket cinema complex gym and spa are all within an easy walk. br / br / br / br / Getting Around br / br / A few minutes walk into town centre and two rail stations nearby you can get to anywhere quickly. Local bus services are frequent with a bus stop minutes away. Fast frequent trains into the Centres of Edinburgh and Glasgow in under 25 mins.